Courses: Mindful Self-Compassion: An empirically-supported, 8-week course in Self-Kindness, Acceptance & Mindfulness. Women’s Cancer Resource Center, Tuesdays, January 8 – February 26, 2019. 2:00 – 4:30 pm. 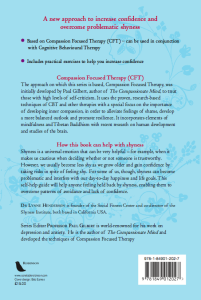 Lynne Henderson, Ph.D.
New group: Compassionate Social Fitness for shyness and social anxiety disorder: A Compassion-Focused Compassion-Focused CBT/ACT/CFT Therapy Group forming in Berkeley. Group completed. Lynne Henderson, Ph.D.
Online Social Fitness Training Study: The online Social Fitness Training study has been completed. An abstract of research results is available. For more information contact Peter Saunders. 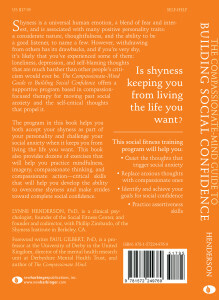 Book: Improving Social Confidence and Reducing Shyness Using Compassion Focused Therapy, by Dr. Lynne Henderson, published in the UK by Constable & Robinson (now Little Brown) in 2010, and as The Compassionate-Mind Guide to Building Social Confidence: using compassion-focused therapy to overcome shyness & social anxiety in the US by New Harbinger Publications in 2011. New podcast: Compassion-focused imagery exercises, by Paul Gilbert, are available on Dennis Tirch’s website. Training Manuals: Social Fitness Training Manuals, by Lynne Henderson, are now in print. 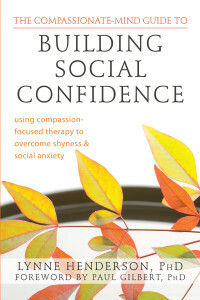 Book chapter: Shyness, Social Anxiety and Social Phobia, Henderson, L., & Zimbardo, P. (2010). In S. G. Hofmann & P. M. DiBartolo (Eds. ), Social anxiety: Clinical, developmental, and social perspectives, second edition (2nd ed.). Taramani, Chennai,India: Elsevier. 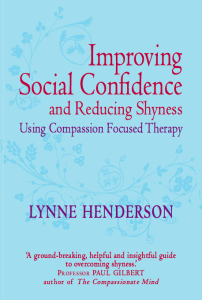 Current Shyness work: Dr. Lynne Henderson is now seeing clients individually and in groups in Berkeley, California. Contact: (650) 814-9210. Dr. Henderson is integrating Compassion Focused Therapy and Acceptance and Commitment Therapy into Social Fitness Training (TM). The Shyness Clinic: The Shyness Clinic has become a part of the The Kurt and Barbara Gronowski Clinic at Pacific Graduate School of Psychology located in Los Altos, California. Clients are only seen individually.